Browse: Home » 2013 » July » Is the Save Disk Icon Dead? Is the Save Disk Icon Dead? I was recently posed with the question of whether the save disk icon should be removed from software as a majority of software users have never actually used a floppy disk. Not to mention that save these days usually takes place with a cloud. While I agree that with the evolution of software certain changes are inevitable, and the disk is antiquated, I also have yet to see anyone present a superior solution. That’s not to say there haven’t been many attempts at change. 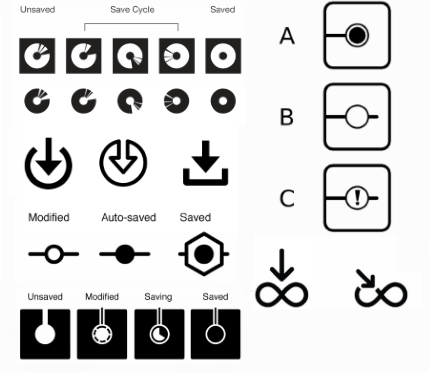 There is a great Branch article where PJ Onori proposes some solid ideas behind what it would take to change the save symbol from a disk. Citing the image, it’s meaning, the concept, and it’s context as some of the reasons it should be redesigned. Some brilliant minds propose a number of possible design solutions critiqued by the group, but nothing quite a perfectly solves it as clearly as the antiquated save icon does. Its such a popular topic of conversation, that NPR even did a story on the floppy disk icon. A quick Google image search for “Save Icon” shows the disks powerful staying power. One disk after another peppered with only a few attempts at replacements. So what if we didn’t change it? There is a great article on the subject of iconic glyphs in use with old origins by Scott Hanselman. I think it shows that even though the save disk doesn’t have much relevance as a disk, it still has a lot of relevance as a idiomatic symbol and concept which is widely recognized and used in modern software along with many others. Idioms, unlike metaphors are learned. Idiomatic user interfaces solve the problems of the previous two interface types [Implementation-Centric and Metaphoric ] by focusing not on technical knowledge or intuition of function, but rather on the learning of simple, nonmetaphorical visual and behavioral idioms to accomplish goals and tasks. Bryan Clark posts an interesting thought in the same Branch article from before, where he notes that the save icon itself is starting to disappear regardless. Lots of software auto-saves your work reducing the need for users to manually seek out a save option. Could this lead to the eventual removal of an icon all together? Is it not just the save disk, but also the act of saving which is becoming antiquated? A couple good additional discussions on the subject from StackOverflow: Save Icon: Still a Floppy Disk?, Save Icon, Is the Floppy Disk Icon Dead? Update: I just ran across another great article, In Defense of Floppy Disks on Boxes and Arrows about the disk icon. This one clearly on the side of keeping the save icon and even employing a survey to prove the validity of its recognition as a save symbol. Good read with some interesting statistics on that and other common icons.